Dress Code: Men - Black Tie and Boardies / Ladies - Marine Theme! Hog Roast, Bar, Beach Marquee, music and more! The party aim is to raise awareness for The Marine Conservation Project. In 2014, it was found that seagrass is one of the most rapidly declining ecosystems on Earth- with 7% of its known area disappearing every single year! Seagrass beds provide many benefits to coastal communities and are home to some of our most charismatic and rare marine life including both types of UK Seahorse. We need your help to make sure that the seagrass found in South West England is protected for future generations so that the vital services they provide for us and the amazing animals that live there, don’t disappear forever. The Community Seagrass Initiative is a local “Citizen Science” project involving people from coastal communities in the conservation of their local seagrass habitats. The money raised from your generous donations will help us to equip and train teams of volunteer seagrass scientists from the scuba diving, kayaking and sailing communities who, with our help, will survey and monitor the seagrass beds for the next 3 years. The information they collect is vitally important as it will contribute towards a greater understanding and better protection for these marine habitats.We will also be promoting awareness of seagrass habitats within the coastal communities of the South West though events, exhibits and online citizen science as well as running schools outreach activities and lessons to ensure the next generation of seagrass guardians know the importance of these wonderful habitats. Thank you for your support and interest in the Community Seagrass Initiative. This years Big Swim " jurrassic channel challenge" took place on the 6th September and was completed by just me! 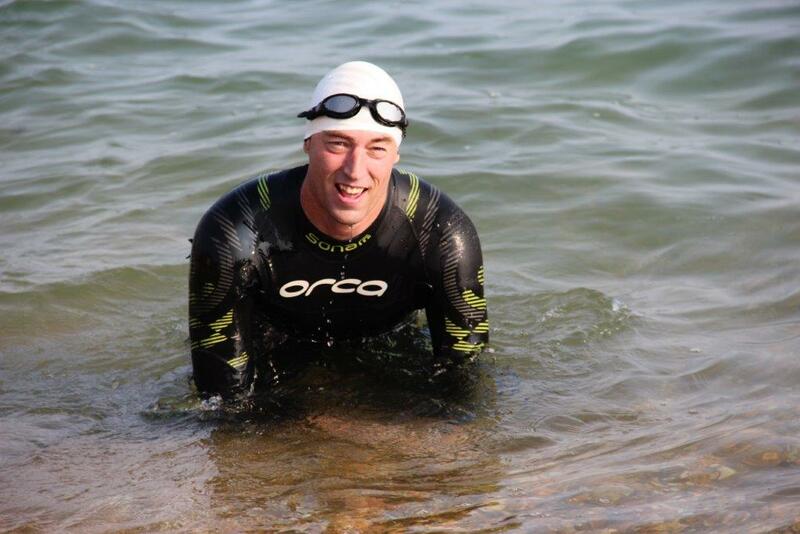 (Matt Flux) The charity is the Alzheimer's society and the swim was from St. Albans head to overcombe and took me 9 hours approx 16/17 miles. Boat support was gratefully provided by matt and Cameron Webb and Simon Davies. There will be a fund raising bbq on Friday 26th September to raise some money for the charity starting at 1800 outside the clinic at Chalbury on the green. A GROUP of keen swimmers battled the elements to complete 10 miles in the sea for charity. 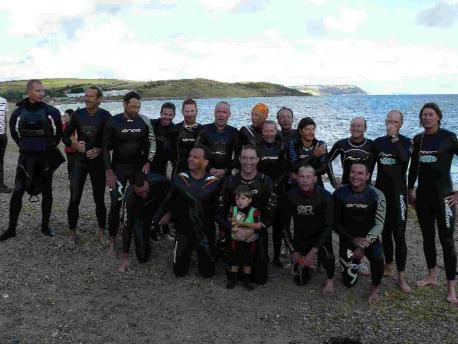 The Big Swim saw a group of friends band together to take on the challenge from Lulworth Cove to Overcombe Corner to raise £2,560 for the Dorchester Opportunity Group. Set up in 1993, the pre-school provides a caring and supportive environment for youngsters with a variety of additional needs. The 19-strong team completed the challenge in five hours and 30 minutes. On the day of the challenge Ian Boid from Weymouth White-water dropped the team off at the start point at Lulworth Cove where they were met by their safety boat and crew of Matt Webb, John Smith, Christian Flux and Anthony Goss. Further safety cover was provided by canoeists Mike and Glynn Clark, Rob and Louise, Ed Speight and Julian Thacker. 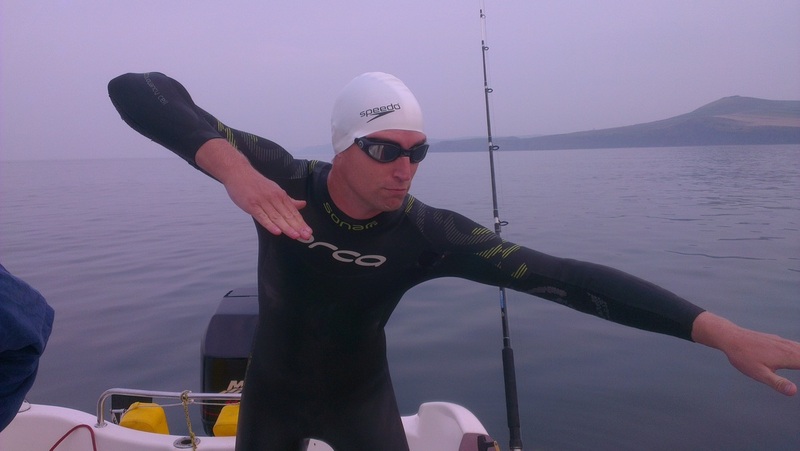 Mr Flux said: “The swim was challenging, with conditions turning against us for a while with the wind and sea started picking up in Ringstead Bay. After nearly six hours in the water the team arrived at Overcombe, where they were greeted by their friends and families and had a barbeque with sausages from the Fantastic Sausage Factory in Weymouth. Mr Flux and the team thanked everyone for their support and donations. 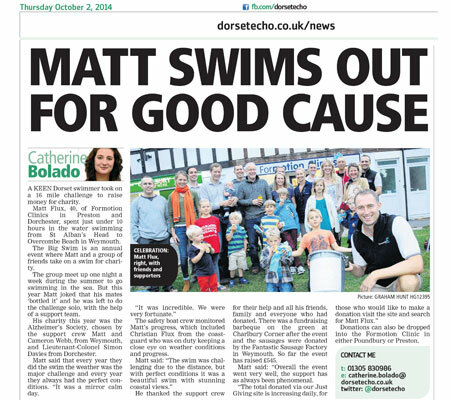 Formotion Clinics were recently featured in The Dorset Echo for their charity swim around Portland during the summer of 2012. 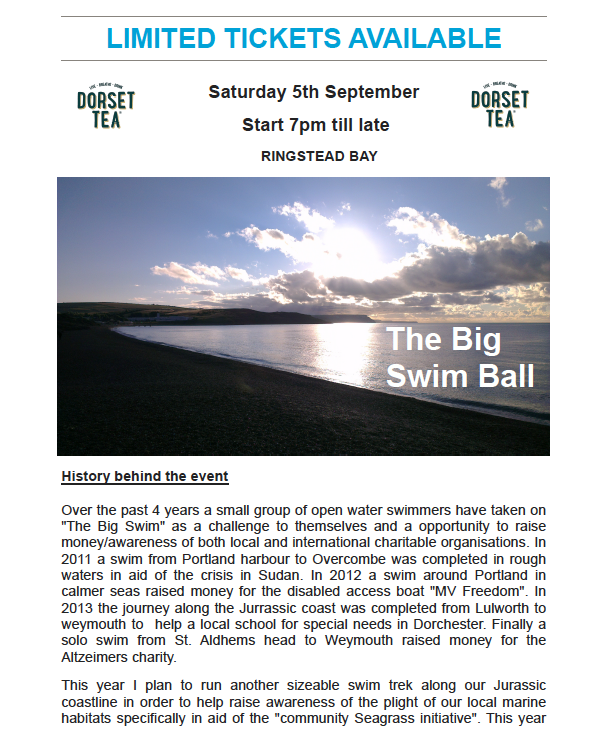 Due to the success of the event they are now planning on a big swim set for sometime in summer 2013. 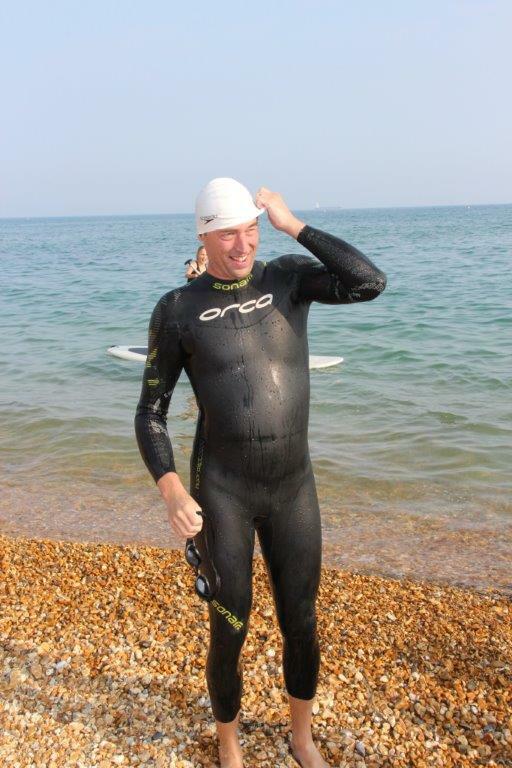 The swim will take place from Lulworth Cove to Weymouth and will raise money for charity. 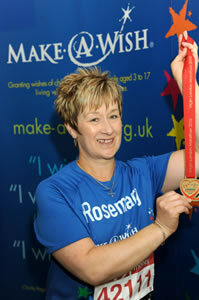 You can make a donation via my page: http://www.justgiving.com/matt-flux1. It's easy, fast and totally secure. JustGiving sends your donation straight to Dorchester Opportunity Group and, if you're a UK taxpayer, automatically reclaims Gift Aid on Dorchester Opportunity Group's behalf, making your donation go further. What's more, JustGiving will never spam or sell your details. I hope you'll join me in supporting Dorchester Opportunity Group. Hazel reaches the summit again. Another athlete who was supported in her attempt on the Snowdon marathon by Formotion Physiotherapy - good luck on this years attempt to better the time. A revolutionary medical treatment device that cures troublesome sports injuries has been brought to Dorset and Matt Flux has teamed up with two consultant orthopaedic surgeons to offer a treatment service to Formotion Physiotherapy patients. Low-energy Extracorporeal Shockwave Therapy (ESWT) has emerged as an innovative and successful treatment for foot, ankle, knee, hip and shoulder injuries. Clinical trial data has shown the technology to be at least as effective as conventional surgery. Painful tendonopathies such as Plantar Fasciitis and Achilles tendonitis have been successfully treated using ESWT, as well as other orthopaedic conditions such as patella tendonitis, trochanteric bursitis, tennis and golfers elbow and calcific tendonitis of the shoulder. Treatment with the Swiss DolorClast, Europe’s leading ESWT device, is now being offered to Formotion Physiotherapy patients after Matt Flux joined forces with surgeons Nick Savva and Nick Fernandez at the Dorset Shockwave Clinic – based at the Winterbourne Hospital on Herrington Road in Dorchester. The results recorded by the Swiss DolorClast have been so impressive that various Premier League football clubs are now using the device to treat their players, and it was also used with great success to treat athletes at the recent Winter Olympics in Canada. The Swiss DolorClast works by passing low-energy shockwaves through the skin to initiate an inflammation-like response in the injured tissue. This prompts the body to respond naturally by increasing blood circulation, the number of blood vessels and therefore metabolism in the injured tissue. This accelerates the body’s natural healing process by increasing cell generation and dissolving calcium deposits. This summer has seen a flurry of sporting activity around our world famous Jurassic coastline with Mark Steens’ Bustinskins team organising a number of top class events. 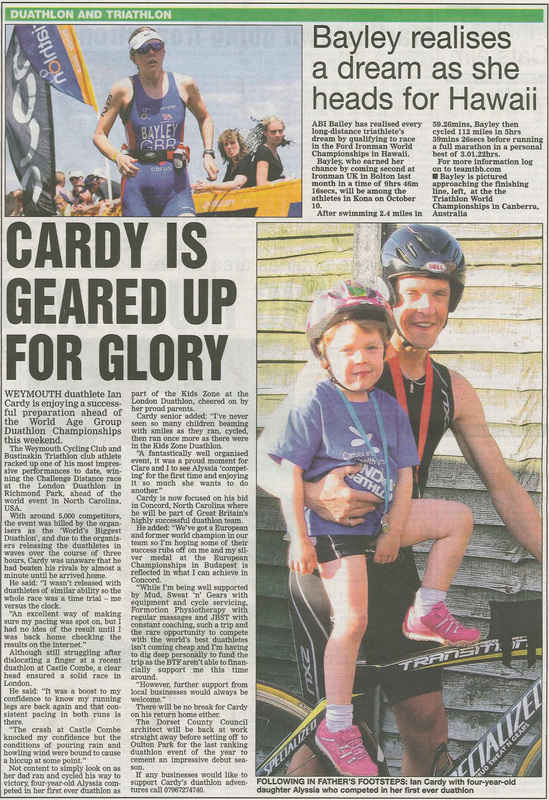 This years Triathlons in Weymouth and Portland were well represented by competitors travelling from across the UK to take part, recognising the unique opportunity to compete on a challenging course. Formotion was in attendance throughout the successful “Splash and Dash” series organised by Bustinskins and was able to provide the Physiotherapy cover at both Triathlons, supporting competitors and attending to injuries sustained through competition. 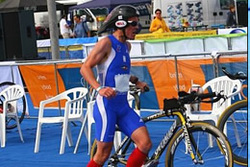 Formotion Physiotherapy are proud to support Fran and Ian and congratulate them on their recent success at European champs.